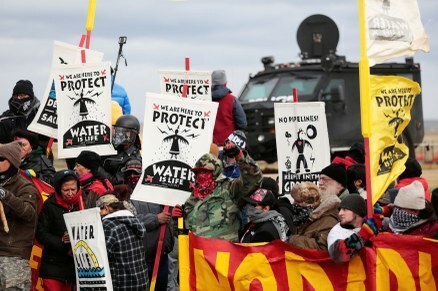 Native Americans and supporters from around the world are digging in against an oil pipeline near the Missouri River — despite being struck with batons, sprayed with Mace and charged with crimes. After the protesters lost a battle in court, the Obama Administration asked Energy Transfer, a Fortune 500 Company, to defer construction. But the bulldozers are coming. Sandy Tolan is there for the Los Angeles Times. Protesters aren't the only ones being arrested, so are journalists perceived to be on their side. Deia Schlosberg, producer of a new climate-change documentary, How to Let Go of the World and Love All the Things Climate Can't Change, is facing felony charges.